They’ve been honing their skills, charging their lasers, and gearing up for battle – but now the Awesomenauts are ready to get back into the fight! Awesomenauts Assemble! will be available on PlayStation 4 through PlayStation®Network, starting March 4th in North America and March 5th in European territories. Awesomenauts Assemble! is the next-generation console version of the popular 2D MOBA Awesomenauts by Ronimo Games. 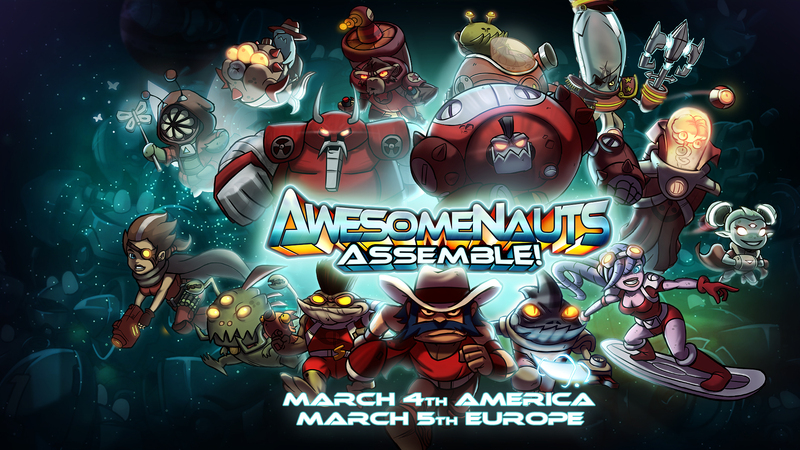 With more than a million copies sold around and a strong community, Awesomenauts Assemble! will offer an accessible MOBA-experience for new players and veterans from the previous console-generation alike. Take on the role of one of fifteen Awesomenauts and square off against online opponents in fast-paced 3 vs. 3 battles. Go at it alone or join the fight with two friends at your side in local splitscreen mode, and never worry about being stuck in a lobby or queue – the drop-in/drop-out matchmaking system ensures you can always jump right into the action! Releasing Awesomenauts Assemble! on Playstation 4 feels like we’re bringing the Awesomenauts home. We originally created Awesomenauts as a console experience, so what better place to release it than the PlayStation 4? It’s the only MOBA you can play together with your buddies on a couch! On top of that, there is a lot of cool new stuff for fans who’ve played Awesomenauts during the previous generation of consoles: Awesomenauts Assemble! brings 7 all-new characters to the console, a boatload of skins to customize your characters, a new map, improved controls, and a lot more upcoming content! In short, it’s bigger, it’s better, and it’s more awesome! Awesomenauts Assemble! will be available on Playstation Network for USD $9.99 / EUR €9,99. The game was developed by Ronimo Games in cooperation with Abstraction Games.